Questions About Unfamiliar Equipment? Just Ask! I’m a swimmer first and a runner second. I could lap-swim in my sleep, and my comfort level running the roads and trails of the Upper Valley is pretty high, too. I know I need strength training to do both of these things well, and my approach to getting it is usually through group exercise classes. With UVAC’s recent expansion, though, I’ve been more and more tempted to log some time with the cardio and weight machines. Determined to push outside my fitness comfort zone, I enlisted the expertise of UVAC staffer Erin Buck. Erin is the Group Exercise Director and PALS for Life Coordinator at UVAC, and also serves as a Personal Trainer and Fitness and Group Cycling Instructor. I asked Erin to help me with the uncertainty that many of us feel when we enter a new workout space, and she delivered with a wealth of useful information and tips. What’s even better? The welcome I received from Erin is the same welcome available to all UVAC members entering the cardio and weight area for the first time. As Erin explained to me, the desk you walk by when you enter the fitness facility is staffed by volunteers who are ready to assist with the types of questions newcomers often have. New to the space? Stop by the desk and let a volunteer know that it’s your first time there and you’d like some help getting started. Volunteers can walk you through the available equipment, highlight cool features of new machines, teach you how to exercise safely, and introduce you to basic workout plans. Erin and I checked out a few of the many machines that were unfamiliar to me, and I was impressed by how fun working out on them can be. 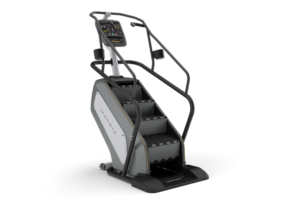 The stair-climber, for example, allows you to choose a landmark like the Eiffel Tower to climb, transporting you out of the Upper Valley and right into the heart of Paris for your workout. 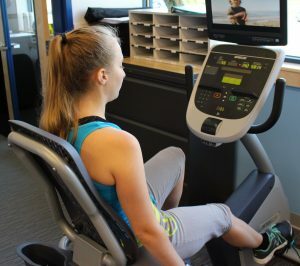 With the new, high-tech stationary bikes, you can pedal through scenic routes that appear on the bike screen, accompanied by a virtual pacer to keep you moving. Erin showed me how many of the machines include workout ideas to get you started, and several include fitness test features so you can gauge your current ability and track it as you progress. In addition to the equipment overview, we talked about everything from how long a good workout should last (it depends on your goals, but any time is better than no time) and how to clean the machines after use (if you remember nothing else, remember to wipe your sweat away). Suddenly, with so many of my questions answered, the new space became a lot less daunting. One of my favorite things that I learned in my walk-through is that the UVAC trainers provide ready-to-use training plans for women and men looking to build up to more intense workout regimens. The plans are right on the wall across from the desk, and you can take one with you and use it to guide you through a circuit of machines, building your strength over the course of several weeks. When you reach the end of the plan, you may find yourself looking for new challenges or help with specific goals, and Erin said that’s when the time is right to enlist a personal trainer. Each trainer has a different background and areas of expertise, so all it takes is a little research into trainer bios to find a great match for you and your needs. I’m looking forward to tackling my next fitness first by giving personal training a try, so stay tuned for a future blog post on that topic. For now, though, I’ve got plenty to keep me busy in the cardio and weight area. I’ve found answers to my questions, confidence to begin, and a great training plan to follow. If you’ve been thinking of giving this corner of UVAC a try, too, take the first step: find a friendly volunteer and in no time at all you’ll be having fun with a new fitness journey.